Since the deployment of the mission in Spring 2008, Andrea Lorenzo Capussela was head of the Economic and Fiscal Affairs Unit of the International Civilian Office (ICO). He ended his mandate in March 2011, shortly after releasing an interview to OBC on the economic situation in Kosovo. A few weeks later a very critical article of his was published in the British daily “The Guardian” on the work and the results obtained in the past few years by the European mission Eulex (but also on ICO activities). Osservatorio has asked Capussela to explain his point of view in depth. In your recent article for the Guardian, you claim that the Eulex mission is now a symbol of incompetence. On what factors is such a critical position based? The rather emphatic title of my article was not chosen by myself but by the editors of the Guardian. It does, however, essentially, match my thoughts. My criticism of the work of Eulex first of all stems from the seriously inadequate management of some cases that I followed closely. One of the most important, the arrest of Hashim Rexhepi, former governor of Kosovo’s Central Bank, who was charged with corruption. Rexhepi was remanded for four months, when three out of the four charges were solely based on anonymous letters. When this scandalous fact emerged, thanks to the defense attorney, the prosecutors delivered new evidence to the judge, but outside the courtroom and without showing it to the defense. This evidence was immediately accepted by the court to confirm the remand. I think there are all the premises to talk about serious breaches of the rights of the defendant, who has been waiting for almost six months to know whether the prosecutors are going to ask for an indictment or for closing the case. In the last three years, despite proclaiming unrelenting struggles against the phenomenon not sparing the high levels of power, no prominent investigation has been brought to trial. Even the anti-corruption operation with the strongest media echo, against the former Transport Minister Fatmir Limaj in April of 2010, led to no visible result. During my mission in Kosovo, I was personally informed of some very suspicious operations. In all cases, I gave the information in my hands to Eulex. In one case at least, I believe I provided very significant documentary evidence. Unfortunately, though, I have never seen any follow up to my reports. Is it only a matter of negligence or do you think Eulex has set political objectives, such as granting stability, above those declared: strengthening the rule of law and fighting corruption and crime? I do not have any concrete elements for answering this question. It does seem to me, though, to be a totally legitimate question to ask. I did receive, for instance, internal instructions from the head of the Eulex mission, Xavier Bout de Marnhac, requesting to receive “preventive information” concerning a long list of mission’s activities, including legal actions, comprising investigations, legal proceedings, court’s decisions. In my opinion, such a request shows a basic misunderstanding of the concept of an “independent judiciary”, on the one hand. On the other, it reveals the wish to be informed (thus to be potentially able to intervene) on the choices of Eulex prosecutors and justice operators. I am certain these instructions were not applied, but the mere fact that it was issued leads to think that there is a will to keep the most delicate operations under control, at least as far as information goes. Do you thus think it is possible that Eulex preferred to “turn a blind eye” on situations that are potentially destabilising for the political balance in Kosovo? I think it is most certainly justified to wonder whether, in outlining operative choices, Eulex weighed political stability or the need to have good relations with local élites. 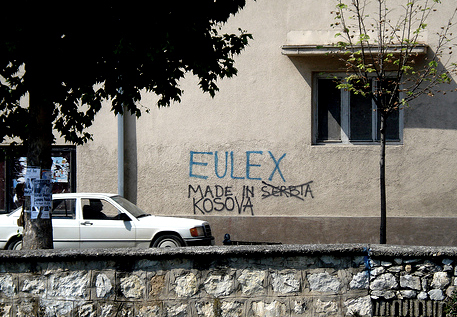 We need to keep in mind that Eulex is in an objectively difficult position in Kosovo. The fact that the European Union as a whole – and therefore Eulex – has not recognized Pristina’s independence makes the mission’s position delicate. In fact, to in order to function, the mission needs the local authorities' collaboration. In some cases, this might have led Eulex to avoid confrontation and tension with the Kosovan political class. However, this does not mean that Eulex is immune to criticism. In the past few weeks, the mission was attacked by members of the Kosovan government as well as the association of former UÇK combatants for its war crimes investigations and its shyness in intervening in Northern Kosovo, where there is a Serbian majority…. This seems to be the worst possible world: the illicit trades going on today are not tackled, so as not to affect the delicate political balance, but at the same time Eulex is kept in check by the same élites that might fear its actions against the spreading corruption. At the same time, I am pleased to recognize that in this sector (illegal trafficking) Eulex seems to operate with greater determination than on corruption and economic crime. However, in the interests of economic development, it would be more useful to focus on the latter, or at least give it the same priority as the investigations into the war crimes of ten years ago. If nothing, because the circles – or the people, even – responsible for the crimes are the same ones. There might be some truth to this cliché: for some, the Balkans have become an actual profession, even if there are many people in international missions who work with dedication and competence. I think the core of the problem lies in the low level of accountability, since negligence and lack of initiative are rarely sanctioned. To function, missions like Unmik or Eulex need diplomatic immunity. This condition is widely questioned. Personally, I think that the balance between immunity and responsibility is to be reviewed, also in light of the experience of Kosovo. The work of our mission in relation to Pristina’s authorities can be divided in three phases. After the declaration of independence, the ICO interacted in a useful and positive manner with the local government, helping Kosovo give itself the shape of a sovereign state. In a second phase, the mission pushed for these institutions to operate better, respecting the rules of transparency and good governance, and was met with substantial collaboration from Kosovo, although often reluctant and a bit fake, and never backed down when it was necessary to publicly criticise the government. During the last months, though, things have changed, for the worse. The local élite was weakened by internal and external factors (Marty’s report, troubled political elections, stagnation of international recognitions). In this context, the ICO chose to work actively to guarantee political stability, almost symbiotically with the government of Pristina. I did not agree with this approach and strongly opposed it: indeed, the disagreement from the mission on my proposal to oppose an operation performed by the government was, after a long debate, the reason for my disciplinary firing, which took place only three hours before the end of my contract. It is also for this reason that I agreed on closing the mission’s economic unit, that I had headed: there were no longer the conditions to work as I deemed necessary. Can you give us some examples of political initiatives carried out by the ICO in this sense? During the electoral campaign, the Prime Minister Hashim Thaçi promised salary increases to almost all public sector workers. A wrong and irresponsible policy, but which was supported by the head of the ICO mission Pieter Feith with public statements that were not discussed and shared with me and which were made almost at the same time as the European Commission and International Monetary Fund were making their harsh judgment. Even Feith’s comments on the political elections (“peaceful and constructive”) are, according to my opinion, problematic. Yes, there were no accidents, but the elections were heavily influenced by frauds. At the core of a functional democracy, there is a free and transparent electoral process: the ICO not expressing criticism on clearly distorted elections, in my opinion, looks a lot like a betrayal of one’s own mission. In the past few months, the United States’ influence on the Kosovan political life has become more evident. What role have the United States played in defining policies within ICO? The strong influence of the USA on Kosovo is certainly nothing new. It is true that it has become more visible recently, even through funny situations, as during the election of former President Bagjet Pacolli and the election of President Atifete Jahjaga. For structural reasons, the US influence is also strong within the ICO. Since the Ahtisaari plan was not approved by the UN Security Council, the only clear legal basis of the mission is the establishment of the Kosovan State. Therefore, the ICO depends, de facto, on the support of some of the “sponsor” States of Pristina’s independence, especially those of the informal group called “Quint” (USA, Germany, France, United Kingdom, Italy), where the USA play a central role. Stronger relations of the ICO with Pristina’s government coincides, in my opinion, with an increase in US influence within the mission. The American ambassador Dell has been very active in defining the 2011-2014 economic plan, recently presented by Prime Minister Thaçi. Have you had the chance to view the document? Unfortunately I have not had the chance to read it. I will just make a general remark: Kosovo keeps underlining its European calling and its intention to adhere to the European Union as soon as possible. It seems curious to me that such an important decision, like defining a medium term economic plan, was taken through an almost exclusive dialog with the American counterpart. I think that it would have been preferable to involve the European partners as well.